Just a quick note again. I’m off to a meeting tomorrow for a couple of days so there’s unlikely to be a post on Thursday. I don’t think that I’ll be dragging any Black Library books with me and I definitely won’t be doing any painting or modelling. I also might not be able to deal with any comments or problems as I don’t know how much internet access that I’ll have, or rather how much internet access I will have for fooling around on the web. I managed to do my back in over the weekend so I’ve been trying (and failing) to ease back on the crafting side of things this evening, which meant that instead of spending an hour or two painting a Wolf Scout I decided to make a start on a bit of scenery. It’s not at a stage where I’m going to show pictures and things but it looks like it might be fun. I’m using plasticard (styrene sheets) to build it and I imagine that, once I get back from this trip and do some more work on it, there’ll be milliput or greenstuff involved. There will at least be candles to model- dribbly candles of course, and pools of gloop and gore. I’m trying to think of a way to meld together the base colours of my boyfriend’s daemons (grey) and my Wolves (snowy sand). I think that I have it, but I need to build up the basic shape first. 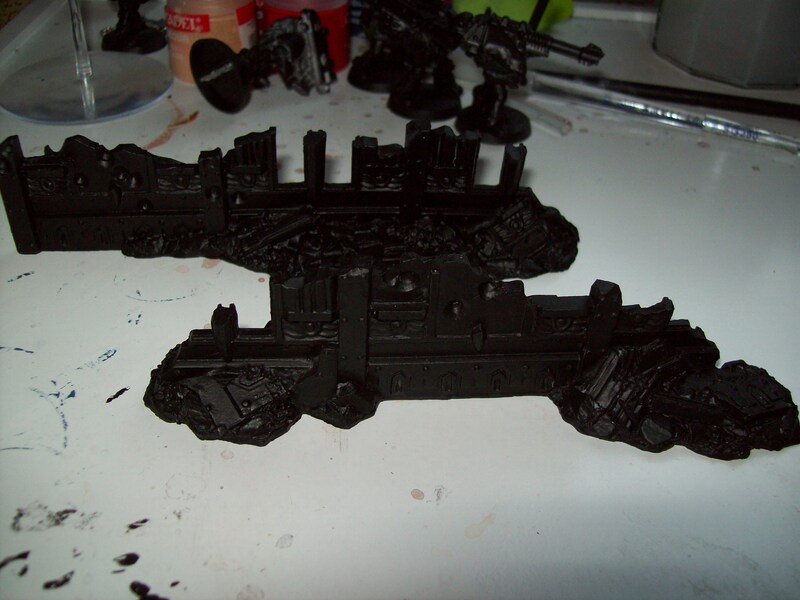 It will be a bit of flat terrain that could be difficult or dangerous terrain or an objective of some sort. I did make a start on painting one of my Wolf Scouts yesterday and today. I’m still pretty happy with the cloak I made, but it’s a bit tricky to paint. Still, I know that Scouts don’t take too long to paint and then I can move onto my Old School Long Fangs, which will then mean that I have room in the queue for the stuff I bought on Saturday. This brings me on to Flyers. I picked up White Dwarf 390 on Saturday and it was actually pretty good. 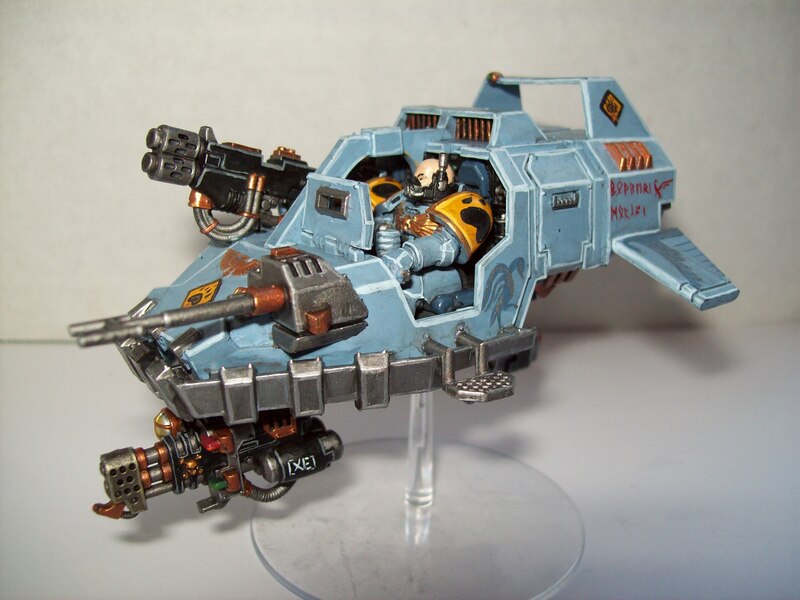 The trouble is that I now want a flyer and Space Wolves don’t seem to be getting one! I know, I know, Space Wolves are rather (very) over-powered, but, as you may have already guessed, I don’t play serious 40K. 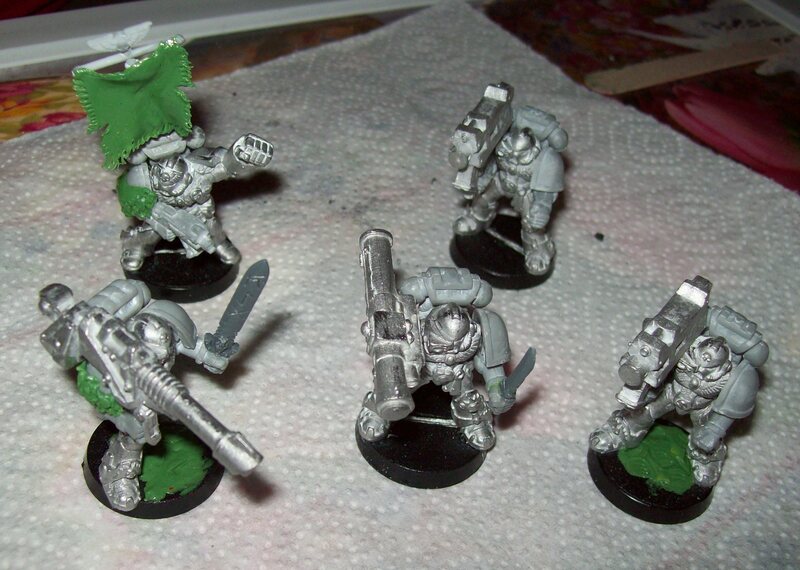 I find the MSU Space Wolf lists a little bit contrary to the spirit of the codex. 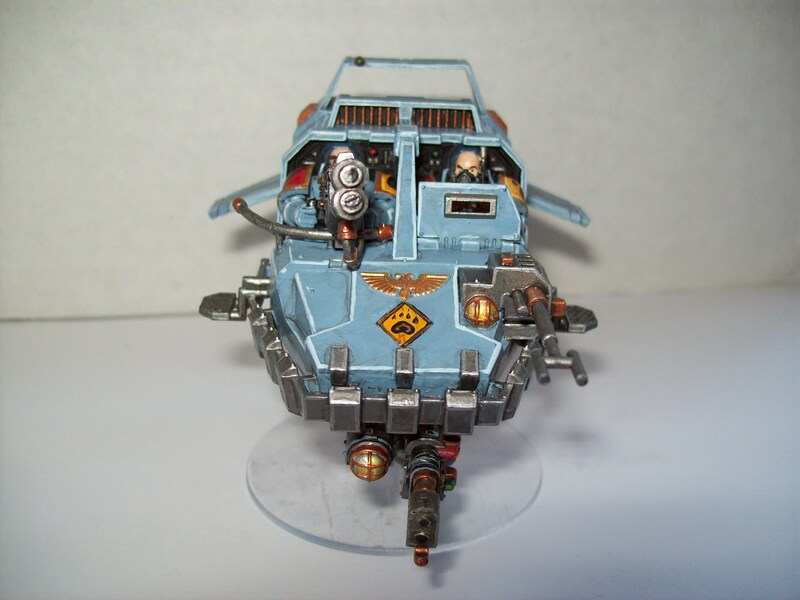 I’m trying to build up a list with a raider theme- lots of fast attack in the form of bikes, speeders and wolves (without Wolf Guard on top- lazy sods) and a flyer would fit the theme. I guess that if I can’t have one, I’ll have to persuade my boyfriend that he really needs one for his Ork list! I have to admit that the Storm Talon has really grown on me. The initial leaked pictures looked a bit ugly, but the pictures in the codex show that the vehicle has a bit more length than I initially thought and it looks really hot in Salamander green! 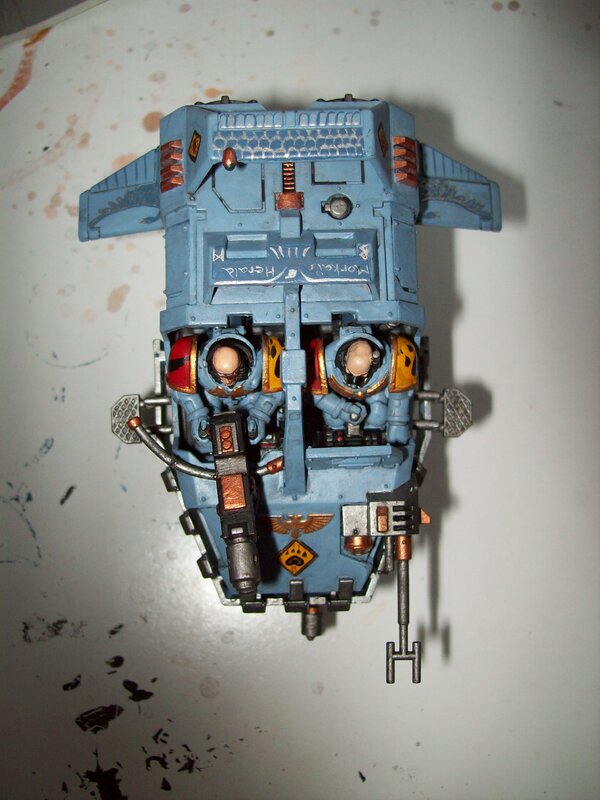 The Ork bombers look great fun and I look forward to seeing some of those about. They feel really orky and also have a wonderful hint of those days spent bodging together plastic planes when I was growing up. The Necron Sythe thingies look quite, well, Necrony, but they haven’t grabbed my attention as much as the Space Marine and Ork flyers. I guess that I should go to bed now and dream of aeroplanes. It’s just like being a kid all over again! 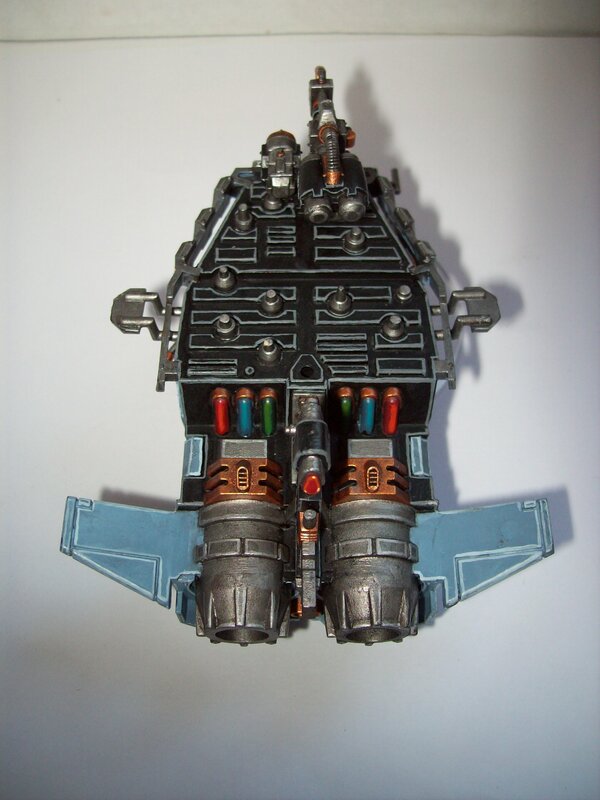 Land Speeder Herald of Morkai: Finished at last. I know, I’m late. I was determined to get this finished last night but about half an hour before finishing I found the thumbmark. Somehow, as I was highlighting, I managed to cover my thumb in Chainmail paint. I then stuck my thumb across the door. Of course, I only noticed this after it had dried. So, after some scraping and cursing and some painting and some more cursing, here’s the fixed model. I’ve learned a few things while painting this. Firstly, Land Speeders need to be partly painted before assembly. There are just too many fiddly bits to leave until afterwards. I’ve also learned that they are quite fragile. I snapped the rail for the multimelta and it’s not easy to fix. It’s too narrow for a pain and not big enough in cross section for easy gluing. I have learned a couple of positive things though, in particular, I’ve discovered that a coat of Lamenters Yellow Glaze over Mithril Silver, gives a very good lamp effect for very little effort. So, that’s the Herald of Morkai. Hopefully she’ll have some sister Speeders eventually, but I want to work on some other things first. It’s too hot for blogging tonight, or that’s my excuse anyway, so I thought that I’d be lazy and show you the new additions to my modelling area. The first new addition is a second lamp. I already have one lamp but my eyesight is really not good and it was not enough. So I went shopping last weekend and picked up a new one. I’m still using the old lamp, as it has a nice warm colour (the new lamp emits quite bluish light), but the second one is bright enough that I’m not straining my eyes to see details any more. The second new purchase is a set of shelves to put my work in progress on. Technically it’s a spice rack but it’s just the right size for 40mm bases so now it’s a wolf rack. This way my projects are all tidy, within reach and less likely to have an accident. I’ve not got anything more to say this evening. I’ve been struggling to think of what to write tonight. I have lots of things in progress but all of them require work. I did try to do a bit of number crunching on the Space Wolves Codex but I gave up when the amount of different possible HQ choices reached the billions. I have got plenty of project work to do this weekend though, so I should have something to talk about on Sunday (Saturday if I’m really good). I was looking forward to the Imperial Primer from the moment it was announced. It is a primer in a tub rather than a spray can. I could think of many uses for it and I’ve already used it for many of them. So, in order to review it I decided to primer two barricades that I had, one using Citadel Paints’ Chaos Black Primer spray paint (it’s what I have, other primers are obviously available) and the other using the new Imperial Primer in a bottle (well, tub). 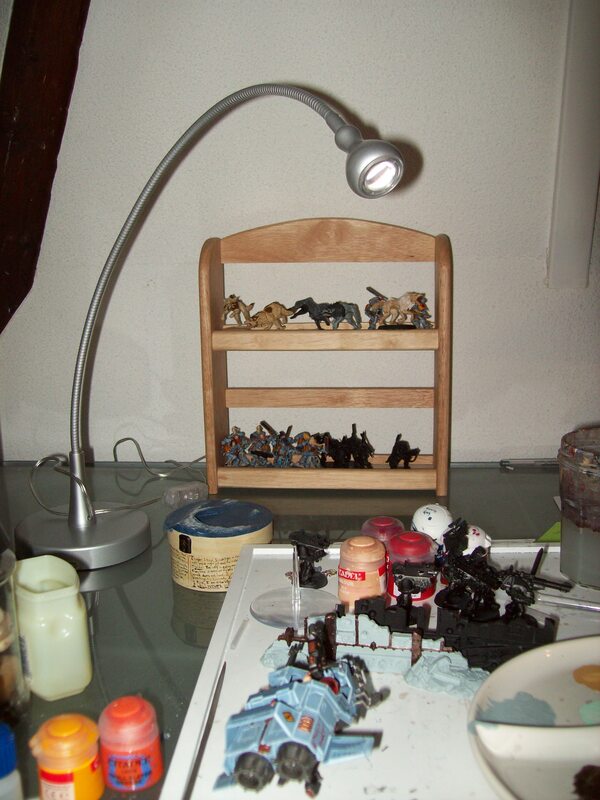 The barricades came from the Games Workshop’s Urban Barricades and Walls set and are made of resin. I know that to do a really thorough test I should test the two primers on plastic, metal, greenstuff and Finecast, but I don’t own any Finecast and I didn’t have any of the rest available that I wanted to use as test pieces. One was the barricades was broken and I superglued it back together, but it didn’t make any difference to the test. I washed both barricades in warm soapy water before I started to ensure that they were clean. I applied the Imperial Primer with a broad brush that I usually use for loading paint onto my pallet and painting very large areas. It has quite soft bristles and tends not to leave any obvious brushmarks on the piece. I used approximately two coats of Imperial Primer, used straight from the bottle without any dilution. For most of the piece I only needed one coat but over larger areas I needed two. I applied a coat of Chaos Black Primer to the other model. I had to coat it in two sessions as the primer could only be applied to one side at a time. After priming the two pieces were quite similar. There are no obvious brushmarks visible on the piece painted with Imperial Primer. I had however missed one edge of the model coated using the Chaos Black spray. 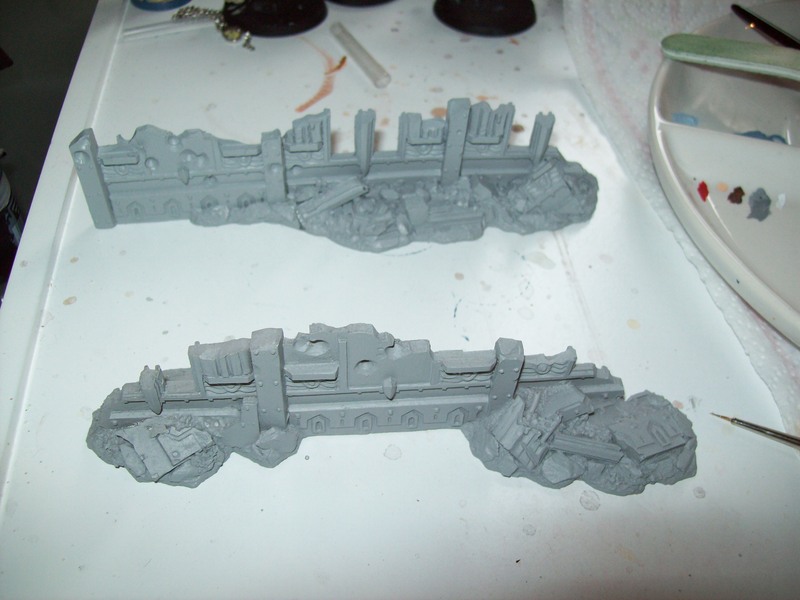 The picture below shows the results, with the front piece being the one primed using the Imperial Primer. So, what were the pros of using the Imperial Primer over the Chaos Black spray? Odour/fumes: The Imperial Primer has a slightly fishy smell in the bottle. However it is quite faint and does not hang around. The Chaos Black spray does produce quite a bit of fumes from the propellant, which are not pleasant. The smell also lingers. I have to spray indoors as I have no outdoor space, and although the area I use is well ventilated, the smell does linger for quite a while. Weather independent: Related to the last point is that the Imperial Primer, as it produces no fumes, can be used in an enclosed space, which, if you live somewhere where it rains a lot, is a bonus. If it rains, my window has to remain shut, which means no undercoating with the Chaos Black Primer. I’m not usually in a hurry to primer something, but if I had to do something in a hurry on a wet day, and we get plenty of them here, I could use the Imperial Primer. Control: With the Imperial Primer it is far easier to control where the primer goes. This means that you can use it in all those little crevasses that the spray misses, prime a new addition to an already painted model or touch up a spot of damage. Of course, there are also cons. 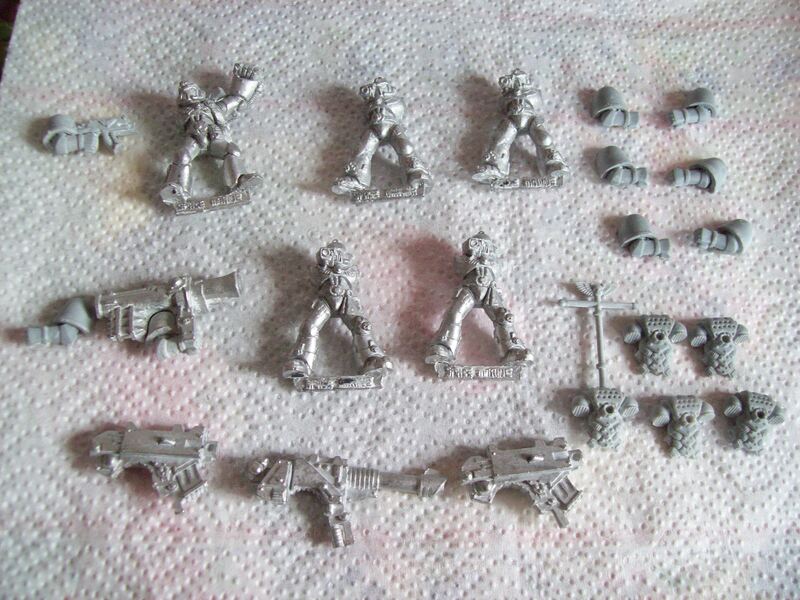 Speed: Using a spray primer means that you can coat several models in seconds instead of one model in minutes. Mess: This is the bottle rather than the product itself. 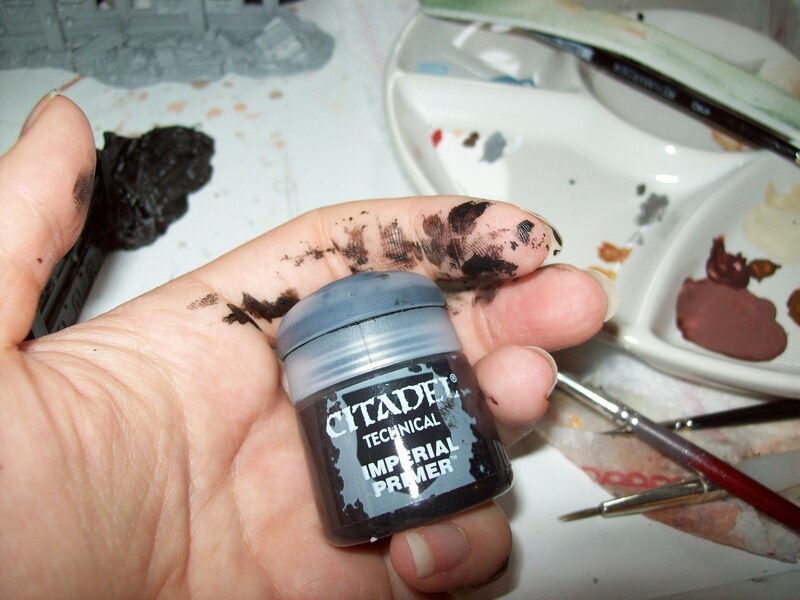 Every time I open the tub I get a coating of black all over my hand and on my modelling area. The picture below was taken partway through coating the barricade with the Imperial Primer. It washes off fairly easily, but if like me, you work in an area of clutter, it’s best to move any painted models well out of the way! In the end the Imperial Primer is a very useful product. It in no way replaces the spray but is a very useful addition to my paint box. I’ve used it mostly to touch up areas that the spray primer has missed, most recently on the awkward shaped cloak on one of my Wolf Scouts. I also used it to fix a meltagun where the spray primer wouldn’t stick. I don’t grade things, I’m not consistent, but the Imperial Primer is very nearly there. It’s an adequate substitute for the spray and brilliant for touching up areas that the spray can’t reach. It’s a pity about the bottle, but I can live with that in return for a product that I’m already finding an essential addition to my modelling stuff. I’ve been trying to catch up with some of my painting backlog this weekend in the form of a Land Speeder that I assembled months ago. I’ve been putting off painting her as she looked a) boring and b) tricky. 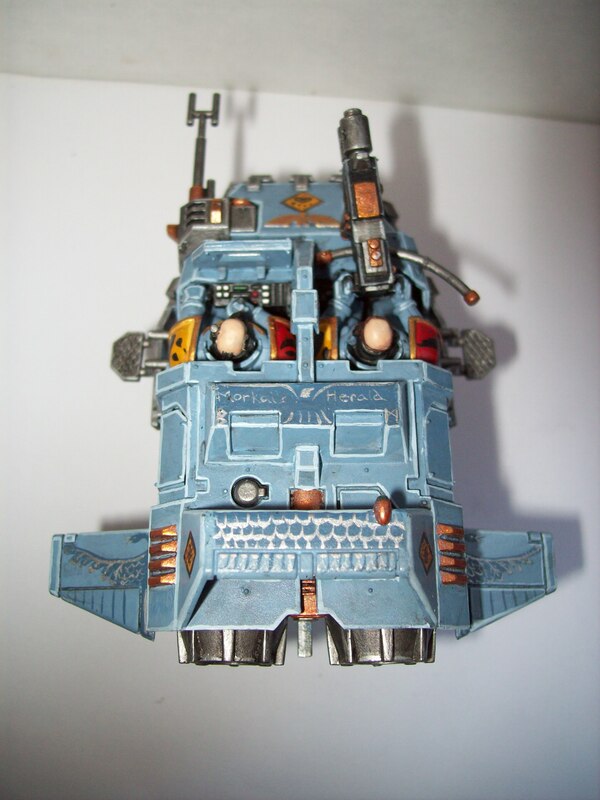 I was right on part b, the model is taking some work, but it wasn’t as boring as I had dreaded, mostly because wide flat areas of blue-grey are much, much easier to paint than multiple small flat areas of blue-grey, such as are found on power armour. I’ve learned two things so far. The first thing is that freehand is very tricky. It’s one thing to sketch something on a piece of paper, or even to paint a simple shoulder pad design, it’s a whole other thing to try and paint more substantial designs on something with angles and sticky-out bits. The other thing that I’ve learned is that Land Speeders need to be painted and then assembled. It’s almost impossible to paint some parts properly. I’ve been reading a lot this weekend in between my battles with the paint pots. I finished Battle for the Abyss and then re-read Mechanicum by Graham McNeill. I’m on to Tales of Heresy now. It’s been really interesting to re-read these books now that I know more of the background. I shouldn’t have any difficulty catching up again before the next book is released in September, the risk is that I’m so easily distracted I may end up reading something else entirely in a similar way to the way my painting queue has built up! Have you ever read something so good that you can taste it? I’ve been struggling with Battle for the Abyss for a while as I just can’t get into it, and in the end I just gave up. Instead I decided to give in and read Wrath of Iron, which was one of the prerelease books that were for sale at Salute in April. It was like going from eating fast food (or the barely edible stuff from the work canteen) to enjoying a good restaurant meal, or from drinking cheap lager to savouring a Trappist beer. I could honestly taste it. On paper Wrath of Iron sounds like a hard thing to sell, the Iron Hands are cold hearted bastards without much personality. However it’s the very thing that makes the book work. There are no heroes in this book, not long living ones anyway. The Iron Hands are monsters. 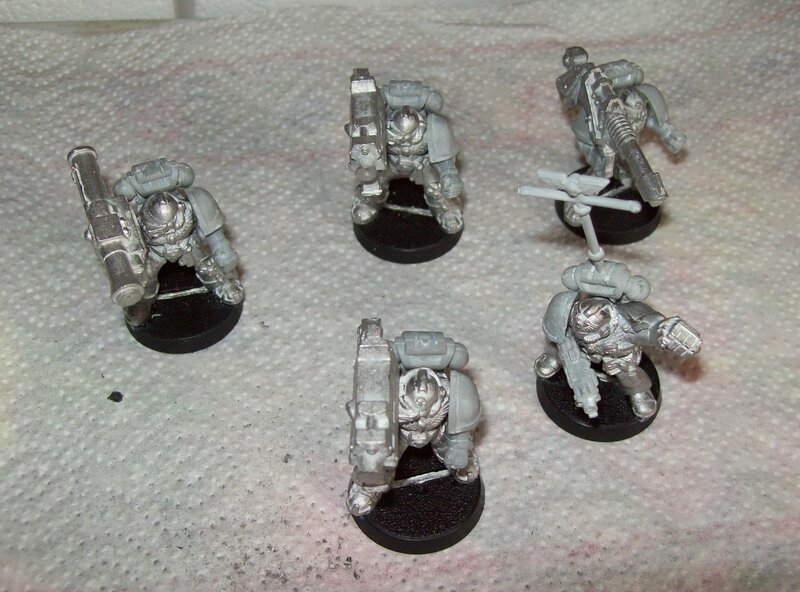 Not in the bounding, psychopathic way of the Space Wolves, or in the terrifying, shadowy way of the Night Lords, they are monsters because as they strip away their biological parts and replace them with metal, they also strip away their humanity. Even the Mechanicum Magos in the book has more humanity left in her than the Astartes of the Iron Hands Chapter. The inhumanity of the Iron Hands is at the core of the book. The battle in Wrath of Iron, although ever present, is far far less important than the monstrosity of the Angels of Death who have been sent to save Shardenus from the heretics in control. It is probably why this book, more than any of the other Space Marine Battles books that I have read, is largely from the perspective of regular humans. Wrath of Iron nevertheless does provide a lot of information on the psyche of the Iron Hands, both from the point of view of the Iron Hands, in particular Sergeant Morovox and the Librarian, Telach, both of whom are a little more human than their compatriots, particularly the Clan Commander Rauth and Iron Father Khatir; and from Magos Ys, who has obviously known the Iron Hands for a long time. It is Ys who suggests something that really shed new light on the Iron Hands, at least for me, when she described them as fearing their flesh (page 148), something that suggests possible body dysmorphia. If you look at this along with the very start of the book, an essay by Ferrus Manus, describing his hands, the tragedy of the Iron Hands becomes evident. In the end though, from the perspective of the mortals around them, the Iron Hands are monsters and when you finish the book you almost wonder if, for the people of Shardenus, the heretics may have almost been kinder. Wrath of Iron is not a happy book, it’s not an easy read. It is however an excellent book and one that makes me wish for more from Chris Wraight. I picked up this book solely on the merit of Battle for the Fang but it is even better than its predecessor. From start to finish Wrath of Iron is outstanding.